Given that we live in the most expensive city in America, we’re all in need of ways to offset costs. When it comes to fitness, remember that we also live in one of those rare locations where it’s actually nice outside most of the year. So put away your wallet: you don’t need an expensive gym membership or high-cost boot camp to get fit, and you can still enjoy group workouts without spending all your money. 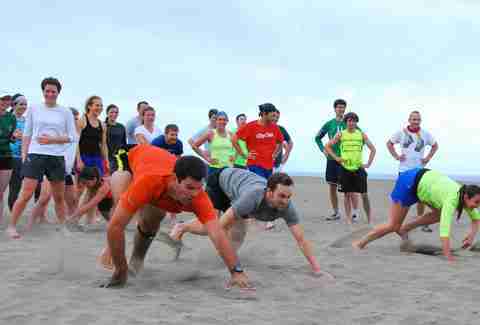 Here are some of the best free workouts and classes in San Francisco. Now grab your workout shoes and get going. There are lots of free yoga classes in the city, so why not pick the one set in a breathtaking, famous cathedral? 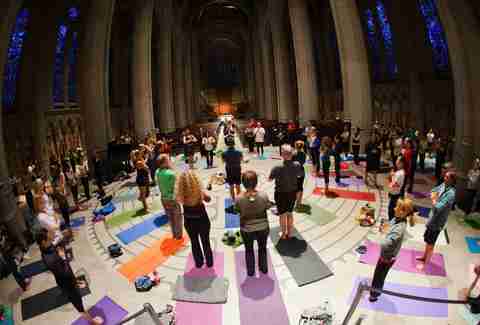 Held in the labyrinth at Grace Cathedral, Tuesday night yoga classes attract hundreds of people. Class runs from 6:15 to 7:30pm on Tuesdays (except in December), and it’s a good idea to get there by 6pm to secure a spot. Each class starts with a brief reflection from one of the church’s clergy members, and is then led by yoga teacher Darren Main. It's a good idea to bring your own mat, though there are some to borrow. While the class is free, a donation of $10-20 is suggested. OK, if you want a classic bootcamp-style class, but you don’t want to pay bootcamp-style prices, then the North Face’s Mountain Athletics classes are for you. The outdoors company teamed up with the November Project last year to offer weekly, hour-long strength and conditioning classes in five cities around the country. Fortunately, since the North Face is based in the Bay Area, San Francisco is one of them. On Tuesdays and Thursdays at 6:30pm, North Face trainers lead a workout designed to be a mix of strength and conditioning. Tuesdays are at Marina Green, and Thursdays are at The Yard at Mission Rock, and you can sign up beforehand. The November Project also leads its own group workouts -- expect lots of high fives and hill repeats -- on Mondays, Wednesdays, and Fridays at 6:30am, as well as special events. Check their Facebook page for the most current details. 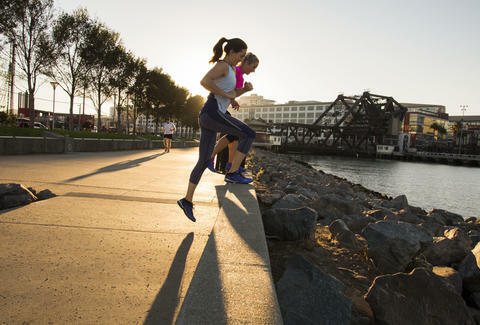 One of the most popular local running stores in San Francisco, A Runner's Mind holds all kinds of regular community events, from city beer runs to track workouts to runner yoga classes. But its strangest event is the monthly Great Cable Car Chase. Held the last Tuesday of the month, runners meet at the San Francisco store on Sacramento Street at 7pm, and then head out to race one of the famous cable cars up a nearby hill. The night typically starts with a warm-up jog to the cable car location of choice -- often the Powell-Hyde line or the California line. Then everyone straight-up races the cable car. If you win, you get a prize. Even if you don’t win, you still get a workout. End the night with a foam rolling and release class, plus refreshments. At its two San Francisco stores, Sports Basement offers dozens of classes, some of which you have to pay for -- but some of which, fortunately, are gratis. There are classes in bike maintenance, lectures on first aid, hiking groups, and workouts: lots and lots of workouts. Check out the group runs on weekday evenings, or try the group ride that leaves from the Presidio store at 9am on Sundays to head across the bridge. Both the Bryant St store and the Presidio store have yoga classes at 11am on Sundays; the Presidio also has a kids’ yoga class immediately following. Or get a workout in and learn some self-defense at the same time, during the monthly self-defense class, held on the first Wednesday at 6:30pm at the Bryant St location. Check the schedule for all the workouts and classes. Sponsored by the San Francisco Recreation and Parks Department, Zumba in the Parks is a series of free Zumba dance classes, held weekly in parks all over San Francisco. Started organically by local teachers, the Zumba Dance Party in the Park used to be limited to Sundays, but now the park district has classes every day of the week. The Sunday workouts in Golden Gate Park and at the Boathouse at Lake Merced remain the most popular, but check the full schedule for up-to-date info and changes. No registration is required -- just show up and dance away. 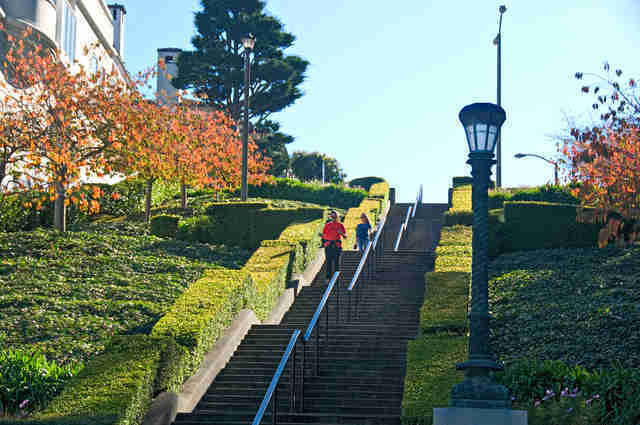 Head to the Lyons Street Steps almost any morning, and you’ll see people getting their sweat on -- often egged on by a personal trainer. But if you don’t want to just run up and down the steps by yourself (and you don’t want to pay for someone to yell at you while you run up and down the steps), then check out some of the MeetUp groups that gather at the popular workout spot. The Weekend Workout Warriors group has regular, high-intensity Lyons St workouts that anyone is welcome to join. Just be prepared to do some burpees in between stair repeats. If the thing missing from your bike rides was a little madcap midnight fun, then the San Francisco Midnight Mystery Ride is probably your kind of workout -- as in, it’s less of a workout and more of an excuse to enjoy yourself. Rarely more than five miles, and always ending at a bar, the San Francisco Midnight Mystery Ride is pretty much exactly what it sounds like: a bike ride that starts at midnight from a location that isn’t revealed until a few days before, every third Saturday of the month. Check the group’s Facebook page for this month’s mysterious ride spot.